Cleverly Solved | I have birds coming down through the fireplace chimney into the House! 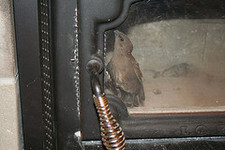 26 Nov I have birds coming down through the fireplace chimney into the House! I was working on removing some wood paneling this afternoon and I heard some bird sounds. Did it seem to come from the inside? I ignored it and then I heard it again, and from the direction of the fireplace. I walked over to the fireplace and I saw two birds, one was standing at the bottom of the fireplace and one was laying at a corner – dead. I opened the doors and windows and went to get the live one, he freaked and started to fly around and I lead her to the doors and he flew out. I then took the dead one and disposed of it. Then I heard more bird songs. I stucked my head and looked up the chimney and it’s dark. Could the birds be coming from the chimney? Isn’t it supposed to be closed? I think there are more birds up there but can’t find their way out and they won’t come down until they are exhausted or near dead. A: MC – It sounds like you have no damper on this fireplace if the birds were just all of a sudden in your hearth. I would go to the roof and inspect the cap. It is likely that there is no screen or a rotted out screen that needs some work. By this rooftop inspection, You will also probably find out if you are dealing with a nest or a couple of curious birdies. If the roof is a steep pitch or not easily reachable be sure to hire a chimney sweep to do the inspection. Considering the birds came right through you may want to consider a Chimney Balloon to plug the flue to keep from losing heat through the open fireplace and to block the bird noise.